Language Tutorial on How to Use your 200 Words a Day! courses. What Happens if you are Stuck during a Test? Grab our free e-zine on Excelerated language learning from Exceltra. This Language Tutorial explains how to use the 200 Words a Day! excelerated learning foreign language courses and explains some of the different Learning Systems that are built into them. The thing to remember is to have a play around with the various settings and see which ones you like, and which suit your learning style. For this tutorial, we take most examples, icons and pics from the 'Learn French 200 Words a Day!' Courses. The main principles are identical for the Learn Spanish, Learn German, Learn Welsh courses. From the Main Menu you can progress by simply pushing the 'Enter' key on your keyboard. . .
... but as you gain familiarity with your 200 Words a Day! Language software course, there are numerous 'Excelerated Learning' Tools and Settings to use, to further boost your learning and re-Study. The Tutorial has 4 pages, and covers the main features of the 200 Words a Day! software packages. Check out the menu on the right hand side of the page for the topics covered on the respective Tutorial pages. There is also on-screen help available on your program accessible by right-clicking the mouse. Enjoy your 200 Words a Day Foreign Language Courses! Just in case you were wondering, Excelerated Learning is a twist on the phrase Accelerated Learning . I once had an email from an indignant web surfer about what she thought was a spelling mistake. Exceltra is our company's trade name which is a generic derivative of 'excel' and 'extra' and then we've taken it a further step to another phrase 'Excelerated Learning' which conveys the nuances of accelerated excellent learning or excellent accelerated learning. First of all you need a Personal Computer (PC) with Windows installed. It works on Windows 95 onwards. So that is Windows 98, 2000, NT, XP. If you have a Mac…. you may be able to run it if you have a Windows Emulator package. We have not tested this, but if you do - please let us know the results. Grab a cup of your favorite beverage. Relax. Shut down all other programs that you may be running on your PC. Put your French, German, Spanish or Welsh 200 Words a Day! Language Learning CD-Rom into the CD-Rom drive on your PC. Now fold your arms. Touch nothing. The CD-Rom will load on to your hard disk automatically. The time this takes depends on the speed of your PC, but it is usually between 6 and 10 minutes. Unfold your arms only to sip your tea / coffee / beer / coke / water / sake /guinness / fruit smoothie etc. During installation the program will look to see if you have a program called Apple Quicktime on your PC. If you have Apple Quicktime it will remind you not to delete this, because the 200 Words a Day! software uses it for background sound. If you do not have Apple Quicktime, it will install it for you automatically. It will ask you a number of questions to which you just need press 'Enter' or 'Return' on your keyboard. When it asks for your serial number press 'Enter' or 'Return' on your keyboard. Program Files - Exceltra French - 200 Words a Day! French. On your 200 Words a Day! language CD-Rom you can also find a pdf file (portable document file) from which you can read the instructions, that you can access from the Windows Start Menu on your PC. Click on Programs - Exceltra French - How to Use this Course. You will need some form of pdf reader to read this file, such as Adobe Acrobat. To get set up and logged in follow the on-screen instructions. You'll be asked for your name, and if you want to add a password. To see the next screen during your course, you can simply press the Enter key. The Main Menu is like the central point from where you navigate to other parts of the course. Here is a screen-shot of the Main Menu. Notice along the bottom are a selection of icons that will take you to different parts of the course. You can click on them to go to the desired section. Lesson: From here you choose your French Lessons, and you can see how many words are in each French lesson, and how many of the words you have learnt. Dictionary: This lists all the words in the course that you have. You can select a word here, and it will bring up the word's definition and pictures, Memory Triggers. 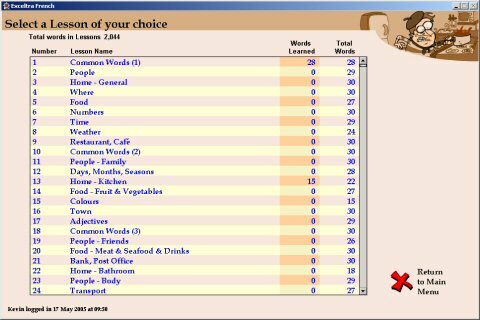 Build a Lesson: This allows you to build your own lessons from the words in the Dictionary. Test: You can select a Lesson on which to test yourself here. you can see what your scores were for each of the Tests you have taken. Settings: This menu allows you change the various settings on the course. You can change the order of the words in the Test, select Excelearning (Rhythmic Breathing) Mode, select Rapid Mode, Auto Mode select Background Music and adjust its volume, change your Settings for the type of Lesson you want for your Scheduled Tests. Help: This is a glossary of the course help. (You can also get on-screen help at any time during your foreign language tutorial by right-clicking the mouse on the screen). Exit: Here you exit the programs and go to the Main Menu from where you can select the different courses. Various courses 'plug-in' to each other, and you would select them by clicking on the Exit icon, where you would be presented with another Menu. Schedule: This Menu tells you what Lesson you should be up to in sequence, and what Test you should be doing. It will also tell you that you will need to repeat a Lesson at certain optimum intervals after you have done the Lesson. In other words, a day after doing a Lesson you should review the Lesson again, and repeat the Test. Likewise do this again after a week, a month, 3 months, a year. But don't worry - the program will tell you when these times are. To take yourself from screen to screen you can just press 'Enter', or click on the 'Next' icon - the right-facing arrow. If you keep pressing 'Enter', the program will take you through the Lessons, Tests & Reviews in a logical sequence. So to restate that in simple language. You do not have to be too computer savvy to work your way through the course. In most cases, when you are stuck, you can push 'Enter' and it will take you to the next logical step. Next icon: is an arrow in the colors of the flag of the particular country's language. For German Lessons it is Red, Black and Yellow, Spanish, is red, yellow, red and for Welsh it is green and white. or. . .. . . if you prefer, start from the Main Menu where you can select Lessons from the Lesson Menu by clicking on the Professor icon. If you click on the Professor icon it will take you to the French Lesson menu which allows you to . . . Choose a French Lesson . . .
…and this is what the Lesson Menu looks like . . .
Each French Lesson is grouped by category. Choose a lesson from the list. On the right are two columns. 'Words Learned' shows you how many of the words in the Lesson you have learned. 'Total Words' is the number of words in the Lesson. 'Words Learned' column shows a list of words in the Lesson. 'Total Words' column shows the all words as thumbnail pictures on one page. To select a Lesson just click on the Lesson title and you will be taken to the first of the . . .
On each language tutorial or Lesson page you are taught one word (or phrase). In the above picture the word being learned is shutter. The French word for shutter is le volet, which sounds like VOLEY. So we have a picture of a man bouncing his VOLLEY ball against the shutter. And of course, with a man as the main character in the picture, we have a Gender Trigger © indelibly printed in to our brain simultaneously, with no extra effort. First the English word appears, then the French word which is voiced by a native French speaker. Then comes the spoken and written Memory Trigger ©. Repeat the word, phrase or sentence aloud after hearing it. cartoon or picture, of the word put into a crazy, zany scene . . .
voice recording of the English word, French word and the Memory Trigger that helps you remember the word. The Memory Masters tell us that the more zany, and silly the scene, the easier is the recall. Repeat icon: To see and hear it again press the repeat icon which is the semi-circular arrow on the bottom right-hand corner of the Lesson page. Also in the picture there are a number of things to enhance your learning, retention and recall. For example . . .
All nouns in French are either masculine (le) or feminine (la) . We call these Gender Triggers ©. For Masculine words the word for 'the' in French is le. This abbreviates to l' before a noun starting with a vowel (a-e-i-o-u). e.g. l'article (m). For Feminine words the word for 'the' is la. This abbreviates to l' also before a noun starting with a vowel (a-e-i-o-u). e.g. l'orange (f). French Learners take particular note here… if you want to score well on your French Tests! To ensure you learn the gender, nouns beginning with l', are followed by an (m) or (f), which you'll need to type in tests. So, for example, to get full marks (3 points) for the word l'orange you must type l'orange (f). i.e you must remember the (f) which says it is a feminine noun. ... typing l'orange would get you 2 points out of 3. ... typing l'orange (f) would get you 3 points out of 3. ... typing l'orange f would get you 3 points out of 3. 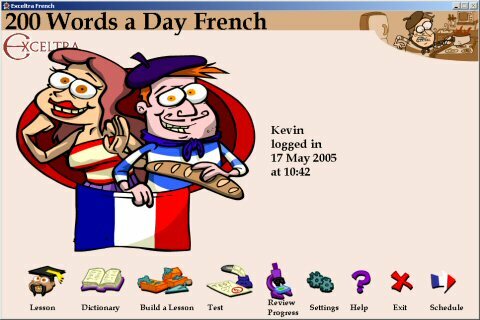 Students of French 200 Words a Day courses should read that twice. . . or three times. In Spanish the masculine word for 'the' is el, and the feminine is la. In German the masculine word for 'the' is der, and the feminine is die. Welsh language also uses masculine and feminine genders. If you are genuinely interested in properly learning and speaking these European languages you must learn the genders. Because the adjectives change according to genders and, also with plurals.... and every time you refer to something you don't call a 'he a she' or a 'she a he'. If you just want a handful of basic words for a short trip it is not that important to get too tangled up in learning the genders. You'll be understood.
. . . remember the Smoking Animal. . . There is a further gender in German which is neuter, and the word for 'the' in the neuter gender is das. There is often no rhyme nor reason as to why something is neuter. For example a little girl in German is a neuter word. ... as is a young woman! They're not feminine articles but take the neuter article! We have invented a unique, and as yet unbeatable Gender Trigger © for the Neuter gender in German, and this is the smoking animal. So our pics with a neuter gender will incorporate an animal smoking a ciarette, cigar or pipe. Very simple and very powerful. In the following example we use the German word for age which is das Alter, and is neuter. 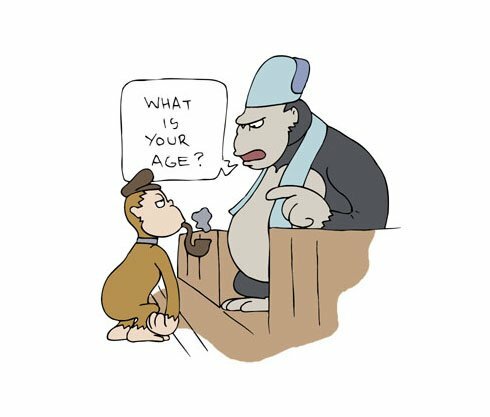 The smoking ape is asked his age at the ALTAR. Famous people make it easier for you to remember the character, the word, the gender! Where possible we use famous people to help you remember the words, the trigger, and whether the word is masculine or feminine. So the character is heavyweight boxing CHAMP Evander Holyfield who is providing us a Memory Trigger © and Gender Trigger © to help you remember the word champ. Be careful on the pronunciation of this one - listen to the native speaker. It sounds more like 'shong'. So with hundreds of celebrities and famous people from history etc you'll more easily remember Memory Triggers and the associated words and genders. and a few hundred others! How to Use Exceltra's Learn Spanish. Learn French, Learn German, Learn Welsh easy-to-use software.